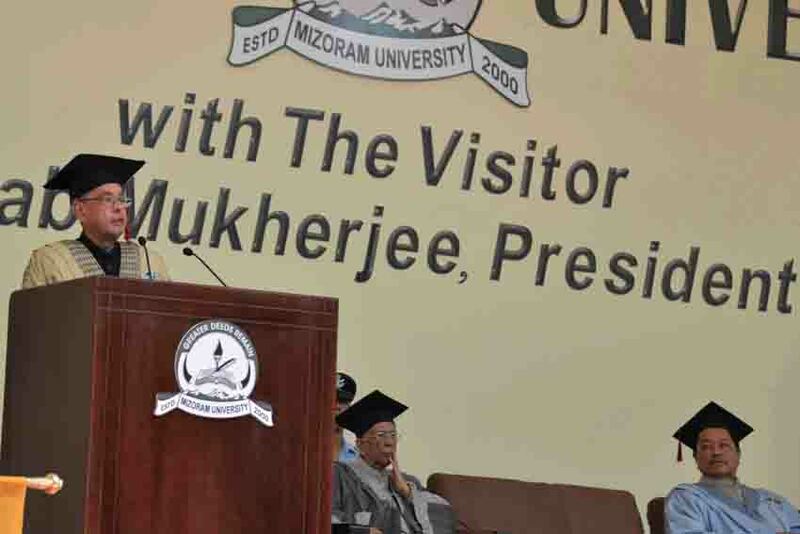 1.It is a happy occasion for me to be here today and address you in this tenth Convocation of Mizoram University. I am also glad to have made use of this opportunity to visit Mizoram, which is my first occasion after I assumed the office of the President of India. Let me thank you all for welcoming me to your State and University. 2.Mizoram is a storehouse of natural beauty, comprising hilly terrains, deep gorges, meandering streams, picturesque landscape, and rich flora and fauna. In particular, the Campus of Mizoram University with its pleasant surroundings and quiet atmosphere is ideally suited for the pursuit of learning. 3.Mizoram was a district of the State of Assam before it became a Union Territory in 1972. In 1987, it became the 23rd State of our country. With a long international border of over 700 kilometres - having Bangladesh to its west and Myanmar to its south and east – Mizoram occupies a vital strategic position. The Mizo people are a close-knit society marked by a complete absence of class distinction and gender discrimination. They are well-known for their hospitality, and are of kind, selfless and helpful nature. 4.Let me congratulate you all on this important occasion. It is hearty to see the joy of accomplishment in all of you. As you step out of your academic universe today, be assured that your education will always keep you in good stead; you will thrive wherever you go and shine whatever you do. Having said that, I want to remind you all that you owe something to the society at large. You are now entrusted with the people’s hopes and expectations. The educated is a trustee of a special responsibility. The upliftment of your less fortunate compatriots is a sacred task that bright people like you must perform. This obligation to your country is something that you must always cherish. It is a bond that you must not sever. So, go; live your dreams. At the same time, live the dreams of your country and countrymen. 5.India is today a nation on the move. In every field of activity – be it business, industry, trade, education or culture – we are marching forward vigorously led by the ideas, enterprise and energy of our predominantly young population. An emerging India offers enormous opportunities for the youth of Mizoram. I call upon you to join hands with the youth from the rest of the country in forging the future of our nation. 6.Some time back, the capital city of Delhi had witnessed certain tragic incidents of attacks on young people from the north-east. Both the Central Government and the Delhi Government have taken firm action, by not only apprehending and punishing the accused but also putting in place measures to ensure that such incidents do not recur. We must ensure that the pluralistic character of our nation and her thread of unity, which is the collective pride of all Indians, are not weakened by such unacceptable events. 7.Education supports two fundamental objectives of human existence: proliferation of knowledge and formation of character. Higher education especially has a unique role to play in preparing the torch-bearers of tomorrow who will endeavour in different fields - from medicine to engineering, teaching, administration, business, politics and social service – to lead our nation to the high tables of global power. 8.Though our higher education sector has rapidly expanded over the last few years, we have less to trumpet about the quality of our institutes. None of our institutions are ranked in the top two hundred positions by reputed international surveys. While I believe that a few renowned Indian institutions can be better placed with a little more methodical approach, a vast majority of our institutions are mired in mediocrity. 9.Many meritorious Indian students pursue their higher studies from foreign universities. Nobel laureates – Har Gobind Khorana; Subrahmanyam Chandrasekhar; Dr. Amartya Sen; and Venkatraman Ramakrishnan – did their graduate or post-graduate studies in Indian universities before they went abroad for higher learning. It is ironical that our higher education system, which is capable of producing world-class scholars, loses them to foreign universities. A serious scrutiny is necessary to counter this avoidable trend. 10.The annual Conference of Vice Chancellors of Central Universities at Rashtrapati Bhavan provides an opportunity to discuss ways and means to quicken the process of change in our higher education sector. This year’s Conference was held in February and I am happy to mention that the Vice Chancellors had a fruitful engagement with other stakeholders and experts from different fields. I am confident that the takeaways would be implemented within the timeframe. Remember that central universities should be the torchbearers of transformation in India’s higher education. 11.Strengthening academic management is urgently required. To make learning more effective, teaching pedagogy must be refined, curricula up-dated, inter-disciplinary approach adopted and evaluation mechanism reformed. To make faculty gain greater expertise in their field, faculty development programmes must be conducted. To achieve excellence, core competencies must be identified and nurtured. To create quality awareness, every institution must be benchmarked and accredited. It is heartening to note that Mizoram University has been accredited ‘A’ grade by NAAC in 2014. 12.A university must strengthen its linkages with other academic institutes through faculty and student exchange, participation in seminars and workshops, collaborative research, and sharing of academic resources. The National Knowledge Network must be put to good use in these endeavours. 13.An interface with the industry can benefit a university in terms of involvement of industry personnel in curriculum design and project guidance, sponsorship of chair positions, and setting up of incubation centres and laboratories. For that, an industry-interface cell must be set up and industry experts in governance structure co-opted. The issue of lack of industrial presence impeding a healthy industrial interface with central universities located in North-East was discussed during this year’s Conference of Vice Chancellors. Ministry-level coordination is necessary to address the difficulties. 14.A higher educational institution is a role-model for the society. It must leverage all expertise to contribute to the socio-economic development of the region. The central government has launched: (i)Swachh Bharat Mission, aimed at a Clean India by 2019; (ii)Digital India programme, to usher in a digitally-empowered knowledge society; and (iii)Saansad Adarsh Gram Yojana, to create model villages. In the Conference of Vice Chancellors, it was decided that every central university will adopt and develop at least five villages. I am confident that this University will live up to the expectations. 15.Certain global trends are emerging in the higher education sector – be it Massive Open Online Courses (MOOCs) that offer the advantages of speed, scale and efficiency; or Choice-Based Credit System that provides students mobility across the higher educational system. Universities must recognize these evolutions in education and prepare themselves to deal with this dynamic environment. 16.Our universities have a duty to promote scientific temper amongst their students. A way forward could be to give wings to the ingenious ideas of students and grassroots innovators. Novel ideas that can be transformed into marketable products deserve mentoring. An initiative taken in several central universities is the setting up of Innovation Clubs. Activities of these clubs must be dovetailed with innovation incubators located in IITs and NITs in the region. I am hopeful that several new innovations will spring within a few years’ time. 17.I thank you once again for inviting me to your annual convocation. I wish you all the very best. Let me conclude in the words of Confucius: "Education breeds confidence. Confidence breeds hope. Hope breeds peace”.